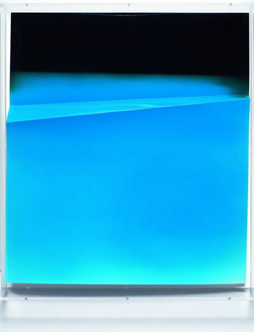 American artist Jim Hodges (b. 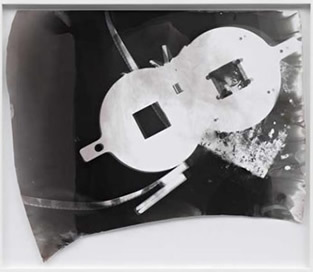 1957) is known for conceptual works utilising a wide variety of mediums. 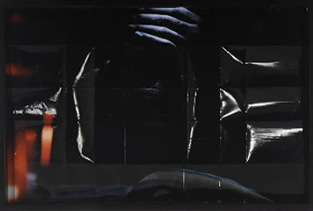 The photographic status of his 1996 work Arranged (left) may be open to dispute, but its sculptural use of the printed image accords beautifully with the subject at hand. By curling adjacent illustrations and securing them with a paper clip, Hodges' slight but elegant intervention restructures existing form in several ways. 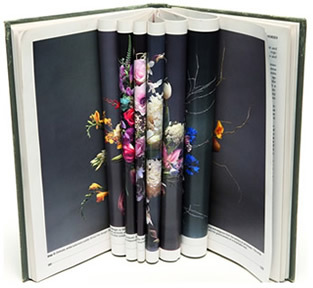 The flat pages of the book are given unexpected volume, the photographic illustrations of flowers made to occupy three-dimensional space. In addition, the segments of photograph revealed by each paper column combine to create a completely new image - a floral arrangement of distinct elements optically fused into one. The emphasis on sculptural form initiated in Wolfgang Tillmans' Paper Drop series (previous page) is brought to a logical conclusion in his Lighter works (2005-8). Consisting of folded photographic prints mounted in custom plexiglass cases, each is an exercise in elegantly minimal abstraction. The focus on material, form and colour is so absolute that these works almost appear non-photographic - which is entirely Tillmans' point. US artist Amy Granat's approach to the creation of both static and moving images is particularly physical, a series of direct interventions that largely sideline the use of the camera itself. 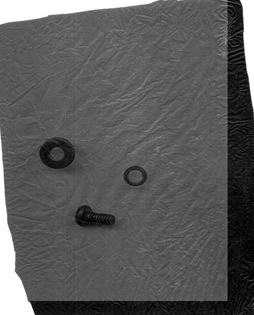 Movies, for example, are produced by marking film emulsion with scratches, punctures or chemicals; an assault on material paralleled in the torn edges and crumpled surfaces that characterise static works such as the photocollaged W.Lee Prints (2007, left). Although the images themselves are reminiscent of modernist works, Granat's use of the prints is far from canonical. 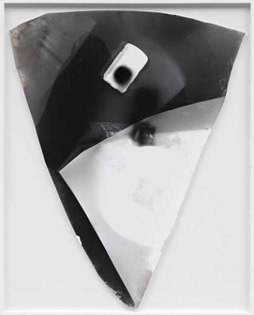 Crumpled, bent and torn at the edges, each is manipulated into a ragged fusion of image, texture and partially aleatory form - an approach to sculptural photography far removed from the cool minimalism of Tillmans' Lighter series (above). Paris-based American artist Oscar Tuazon creates sculptures and installations that combine the formal language of architecture with a fascination for alternative modes of habitation and methods of construction. 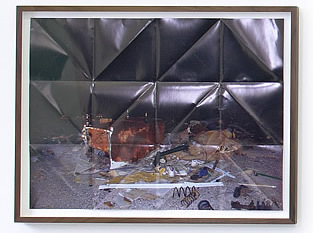 His use of the folded photograph echoes these concerns, its three-dimensionality as much an architectonic gesture as an exploration of the sculptural potential of the photograph itself. 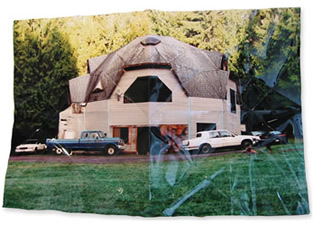 Several photographs depicting domestic use of the geodesic dome in Tuazon's native US, for instance, are folded to reflect the multiple facets of the roof structure (above, left). In a series of photographs documenting temporary dwellings found in the woods of Portland, folds form an alternative space that echoes the makeshift construction of the depicted architectures, while also mapping them within a grid of creases (left). Tuazon's 2009 Afognak series explicitly addresses the photograph as a sculptural/architectural entity, affixing C-prints to twisted aluminium supports. Afognak Night (below) makes particularly intricate use of this strategy, shaping the image into a three-dimensional terrain of ridges, bumps and blisters that fills the abstract visual with integrated abstract form. Jack Pierson's well-known practice encompasses several lesser-known experiments with photographic form. 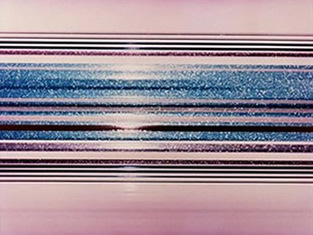 Striped One (1998, left) for example, reveals a sunset through variously tinted strips, the ubiquity of one of the most photographed subjects transformed into an image resembling a delicate abstraction. 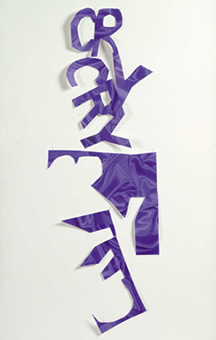 Works in which words are cut from photo-printed paper, such as Cry (left), admittedly struggle with the category of photograph, but present intriguing sculptural possibilities. 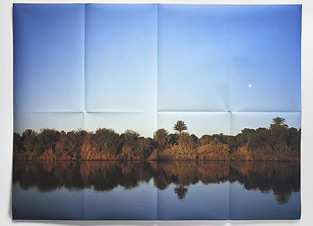 And finally, recent pieces such as Ancient Morning (2010, below) adopt the folded format so prevalent in current practice; used, in this case, to delineate the formal compositional structure of image itself. For young UK artist Abigail Reynolds, the fold is paired with the cut to provide a lattice-work of interwoven photographic plates salvaged from books and other printed matter. Her best-known series of works superimpose images of urban landmarks taken at different points in history, but from nearly identical vantage points (left). 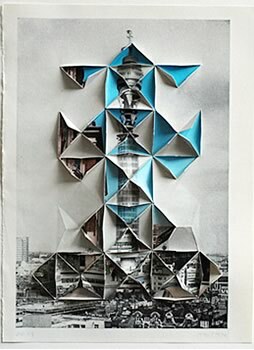 Folded tabs thus reveal distinct temporal states while emphasising the permanent presence of the photograph's subject. 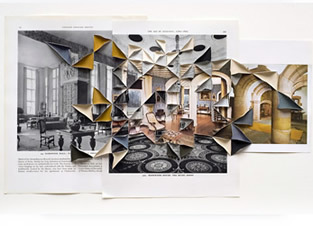 In other works, the fold offers a point of connection between images for which Reynolds posits an associative or thematic parity (below). Fused together in a flurry of half glimpses, these sculptural pieces sprawl organically as if manifesting a dynamism that cannot be contained.